The when will they?/No, seriously when will they? saga of the Revis-to-the-Buccaneers trade rumors is finally over. 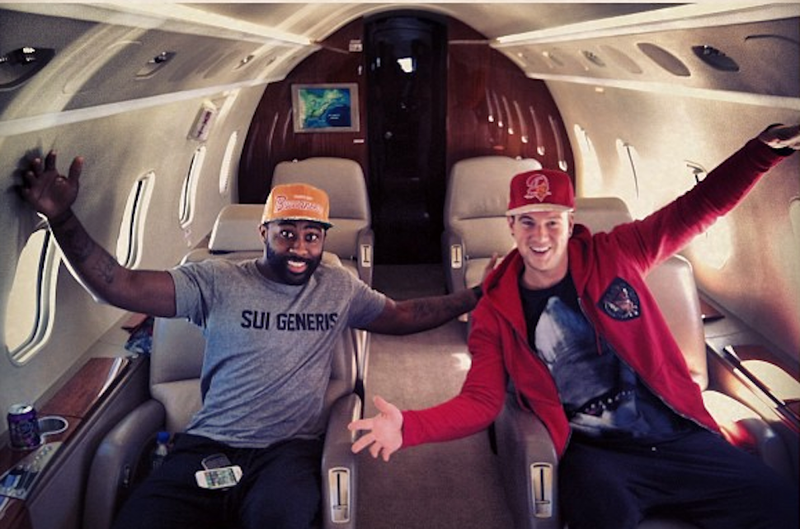 That's Revis on a flight to Tampa earlier today, rocking some throwback Buccaneers gear. And here he is presumably signing a contract with Tampa Bay. Manish Mehta of The Daily News is reporting that the terms of the deal are six years and $96 million—none of which is guaranteed (whatever that means, anyway). The Buccaneers also gave up 2013's first-round draft pick along with a conditional fourth or fifth round pick in 2014. Obviously the full details aren't out, but it sure seems like things had gone so sour between the Jets and Revis that either the player had no interest—regardless of guaranteed money or not—in signing with the team or the team had no interest in guaranteeing any money to its best player and, yes, a one-of-a-kind player in the league. The draft begins this Thursday.